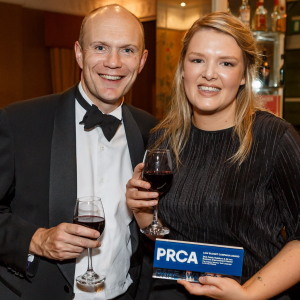 A campaign created and delivered by DCA PR for St Ives Business Improvement District (BID) was awarded best Low Budget Campaign at PRCA DARE Awards 2017, held at the Marriott Royal Hotel in Bristol on Thursday June 15. Read on to find out what the challenge was, how we tackled it, and what the results were. Or call 01208 77900 if you want to chat to us about a campaign. The objective was to find an innovative way of solving the problem of gulls swooping down at people with food in St Ives, taking this negative issue and transforming it in to a positive. We wanted to stop people seeing the birds – a protected species – as pests and instead begin to understand their actions and adapt, allowing man and bird to both enjoy their time in the Cornish seaside town. The aim of ‘The Daily Gull’ was for local businesses such as fish and chip shops to adopt a different approach to the seasonal issue of swooping gulls and to educate not only holiday makers but also locals about the birds, how they act and how the issue can be addressed. The initiative was created due to heightened concerns from local businesses that the hungry gulls were affecting the holiday destination’s image, and was something the BID addressed in its manifesto when it was brought into the town. Working closely with the St Ives BID, we met and discussed all the issues affecting them to allow us to focus on the problem of feeding and swooping gulls. Interviewing businesses and visitors, we also filmed the gulls in action and captured how people interacted with the birds. Members of DCA spent a lot of time in the town to observe how people and gulls interacted. We also consulted leading seabird expert Dr Voila Ross-Smith, Science Communications Manager at The British Trust for Ornithology, to be able to understand and convey what the birds did, why they did it and how people could respond to the gulls’ animal instincts to help limit the number of swooping incidents. For example the importance of visitors’ maintaining awareness of their surroundings, establishing eye contact with gulls and understanding gull body language and calls to spot the tell-tale signs they may plotting to relieve you of your pasty or ice cream. We wanted the information to be delivered to a large audience in a fun, easy to understand way so designed a newspaper-style leaflet called The Daily Gull. The printed greaseproof paper for fast food outlets showed people how to understand gull language in a bite-size way. We believed they were more likely to take the time to read about the issue if the news was handed to them – wrapped around their fish supper. The story captured the imagination of the national media and was featured in titles including the Metro online, Daily Express, Daily Star and The Sun. There was also 10 minutes of coverage on BBC Spotlight regional TV news including an interview with both BID managers as well as local businesses and the public. Plus over 13 minutes of interview time on BBC Radio Cornwall, including an in-depth interview with BID manager Carl Lamb about the initiative. The BID team were also contacted by Scotland BID representatives, wondering if they could adopt the idea for their summer project. Fish and chips go hand in hand with a trip to the seaside town of St Ives – and so does the sight of swooping gulls flying towards unsuspecting visitors enjoying a bite to eat. The issue even contributed to a teenager tumbling from a pier in the town last summer and raised fears that the birds were affecting St Ives’ image. Although the local BID team had come up with a couple of initiatives including anti-seagull spikes, we were keen to find a creative and less provoking solution to tackle the problem, which not only benefitted the businesses and the town but also the gulls themselves – a protected species. Rather than see the gulls as pests, we wanted to show people why the birds acted the way they did. By understanding them, visitors could then change the way they acted around the gulls therefore limiting food thefts and helping man and bird to both enjoy sunny St Ives in a more harmonious way. So we decided to use the very thing that entices the gulls to swoop and steal food in a bid to stop them. We spoke with gull experts who explained how people could minimise their chances of falling foul of the birds by understanding their behaviour. And we found that the most effective way of getting this message across was through the The Daily Gull newspaper, a specially-made greaseproof paper served up by takeaway businesses on the seafront. This truly original idea was met with positivity by the BID, businesses and visitors who all appreciated the unique way of getting the message of greater gull understanding across to the public. And it shows that today’s news is also today’s fish and chip shop paper. This is an issue that will never go away but by educating human visitors to St Ives we have offered a pioneering approach to tackling the issue – in a way never thought of before. And the impact has been very positive. Business leaders agreed that shops and visitors were very keen to learn how they could adopt a positive approach to gulls with hopes that a greater understanding would help minimise the number of food thefts and swooping incidents carried out by the birds. Education and understanding is key to harmony for all those in St Ives and this creative new scheme has shown there are positive ways of stopping bird attacks.